The richly fragrant bark of the cinnamon tree has been used for centuries as a culinary seasoning and botanical medicine. Cinnamon's spicy-sweet flavor makes it a popular ingredient in desserts and beverages, and some naturopathic health care providers recommend cinnamon bark supplements for use in complementary and alternative medicine. Although pregnant women can eat foods containing cinnamon with little risk of adverse effects, most health care providers recommend against the use of cinnamon bark supplements during pregnancy. Cinnamon's benefits aren't specific to pregnancy. Like most plant-based foods, cinnamon bark is an excellent source of naturally occurring antioxidants. It's low in sugar but very flavorful, so it can be a tasty substitute for less healthy foods during pregnancy. The American Cancer Society recommends homemade teas containing cinnamon and fruit as a caffeine-free alternative to conventional teas and coffee. Cinnamon bark may provide support to women with gestational diabetes, a condition that causes unstable blood sugar levels during pregnancy. The Mayo Clinic says diet and exercise are sufficient treatments for most cases of gestational diabetes, but other treatments are sometimes necessary. According to the Mayo Clinic, cinnamon may help reduce blood sugar levels in people with Type 2 diabetes--a similar condition--although its efficacy is still a topic of debate. Until further studies have validated cinnamon's use as a complementary treatment for gestational diabetes, most practitioners recommend against its routine use. No studies have established a safe dose of cinnamon bark for pregnant women. The medical information website Drugs.com says most general studies have involved adults taking 1g to 1.5g cinnamon bark per day. People who aren't pregnant generally tolerate this dose with few side effects. Despite a lack of conclusive safety evidence, Drugs.com and the U.S. Food and Drug Administration consider cinnamon to be safe during pregnancy when used in the amount found in food. Don't take isolated cinnamon supplements unless your obstetrician or midwife recommends them. Most of cinnamon's side effects are relatively mild. 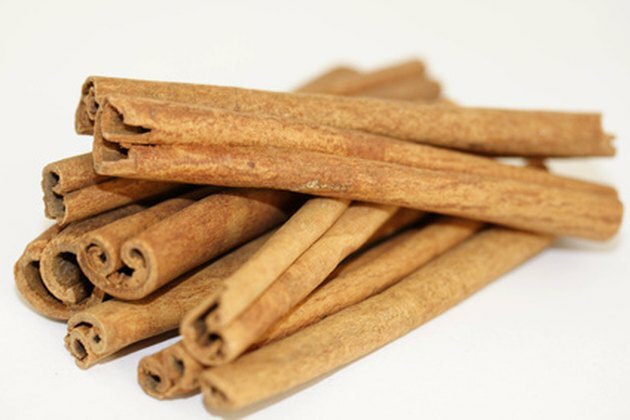 Drugs.com says large doses of cinnamon can trigger skin rashes. People who are allergic to cinnamon may develop severe allergic reactions, including anaphylaxis, after exposure to a cinnamon supplement. Avoid cinnamon supplements entirely if you have a known allergy to cinnamon bark or to the plant Peru Balsam. You may also develop heartburn or indigestion after drinking cinnamon tea or taking cinnamon supplements. Because studies have not evaluated cinnamon's safety during pregnancy, most of its risks remain theoretical. Fetuses do not have well-developed detoxification systems, so their bodies are sensitive to damage from everyday toxins in foods and medicine. In theory, cinnamon may damage the developing organs of a fetus or contribute to the formation of birth defects. Cinnamon's effects on the uterus are also under-researched; no one knows whether it may trigger contractions or stimulate preterm labor. Although practitioners don't believe that these problems exist when cinnamon is used in food, avoid cinnamon supplements unless directed otherwise by your health care provider. Is it Okay to Take Cinnamon Tablets While Pregnant? Is it Okay to Take a Cinnamon Supplement While Breastfeeding?